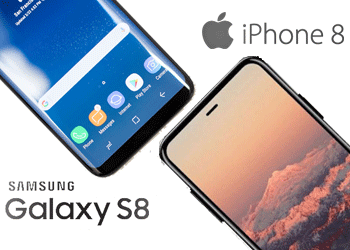 Apple iPhone 8 vs Samsung Galaxy S8, a clash of the Titans about smartphones in 2017. Apple has, despite the selling good numbers of iPhones, experienced the third straight drop in revenue in 2016. It's clear that it will deliver more in iPhone 8 than iPhone 7 to revitalize the market. While for Samsung, its profit has taken a hit due to the Galaxy Note 7 scandal. So the result of the iPhone 8 and Galaxy S8 competetion is significant for both the company's future. While for average users, we do not care about the future of both companies, but the flagship iPhone 8 or Galaxy S8 itself. We just wanna know some practical things to make up our mind on which phone to buy, such as how much the phone is, what are the specifics, features and more. 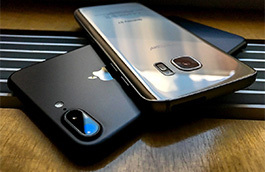 Based on these, we'd like to delve into what's currently know about the two flagships' comparison. 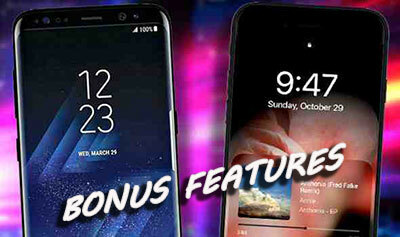 Part 1: Buy Galaxy S8 or Wait for iPhone 8? Backup Your Data First! No matter you'd like to buy Galaxy S8 right now or wait for the upcoming iPhone, you'll need to move all your data from old phone to the new one. MacX MediaTrans is absolutely the easiest one, offering a straight forward process to backup and transfer your local data to iPhone 8, covering photo, music, video, e-book, podcast, ringtone, voice memo etc. iPhone X/8 VS Samsung Galaxy S8, What's the Biggest Differences? 1. Design & Display. iPhone 8 continues the design of iPhone 7/Plus. Instead of seeing all screen design on iPhone 8, iPhone X is designed in all screen with OLED Super Retina display. BTW, Apple's OLED tech is imported from Samsung, so you can see the same curved OLED display on iPhone X/8 and Galaxy S8. 2. Face Recognition . At the mention of what Android-inspired ideas on iPhone, the face recognition comes to be an envidence. Earlier in 2016, the face recognition has been applied in Samsung Galaxy S8, even if it's not perfect. Whereas iPhone X announced that you can unblock your iPhone, pay for Apple Pay, iTunes, App Store, auto fill Safari as long as you set up Face ID on iPhone X. 3. Screen Ratio. 16:9 screen ratio not longer serves iPhone 8. The new handset will go the same screen ratio with Samsung Galaxy S8, namely 18.5:9. 4. Camera.Actually iPhone 8/Plus insists on the camera of iPhone 7 and iPhone 7 Plus. But for iPhone X, there're big differences: 12MP wide-angle and telephoto cameras, ƒ/2.4 aperture, Portrait Lighting, 7MP front camera that enables Animoji as well. There are no confirmed reports about either Apple iPhone 8 or Samsung Galaxy S8, but rumors have been around about both of them. For example, iPhone 8 is expected to be Apple's first iPhone without a home button. Since the release of Samsung Galaxy S8, here are some surprises compared to Galaxy S7 and Galaxy S6. According to the iPhone 8 and Galaxy S8 specifics, here list the probably major specs comparison between the two. iPhone 8 introduces an all-new glass design, continuing the iPhone 7 and iPhone 7 Plus 4.7-inch and 5.5-inch screen. Unlike an OLED Super Retina display on iPhone X, iPhone 8/Plus insists to use the LCD display, which may not as sharp and crisp as the OLED, but save the cost indeed. 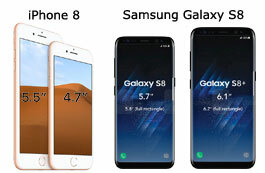 Well, when comparing iPhone 8 with Samsung Galaxy S8, Samsung offers a 5.8-inch Galaxy S8 and 6.2-inch Galaxy S8 plus model "Infinity Display", with curved EDGE Super AMOLED screens at 570 ppi and 529 ppi respectively, supporting 4K resolution as well. Updated: Though Samsung Galaxy S8 owners are already complaining about red-tinted screens and fragile display in big impacts. Also there are burn-in problems on OLED screens. Besides, Samsung Galaxy S8+ users are reporting facing the random restart issue as well. So it's unclear whether iPhone 8 or Galaxy S8 will win in this round. Apple iPhone 8 will utilize A11 chip, by default. And TSMC has begun to tape out the design for the A11 chip on a 10-nanometer process, completing the first stage of the design that is likely designed for the 2017 iPhone 8. The A11 chip, like all of Apple's chip upgrades, will be both faster and more energy efficient, in addition to being smaller. As for Samsung Galaxy S8, it comes with a Octa-core (2.3/2.35GHz Quad + 1.7/1.9GHz Quad), 64 bit, 10nm processor, which allows devices to download files at speeds of up to 1 Gbps. In case, you're more interested in the mistery A11 chip, you can consider to upgrade your iPhone 7 to iPhone 8 to have a try. Camera can be a decisive factor when buying a smartphone. And iPhone 8 and Galaxy S8 will never let you down since both of them have shown the inclination towards a higher resolution camera in their recent models. iPhone 8 offers a dual pixel 12MP rear and 7MP front camera. It's noteable that the Apple 10 year anniversary iPhone X is featured with a more advanced camera: Dual-lens 12MP wide-angle and telephoto rear cameras; 7MP front camera enabling Animoji. While Samsung Galaxy S8 will be equipped with a 8MP front camera and a 12 rear camera, but with the help from a feature called Bixby Vision, your Galaxy S8 camera will get a little "smarter", and be able to provide contextual information about what you’re viewing. Anyway, both of the two handsets will supports 4K video recording, thus you are able to record and upload 4K videos to YouTube at hand instead of with professional camcorders. In terms of storage, both iPhone 8 and Samsung Galaxy S8 come along 64GB and 256GB versions. 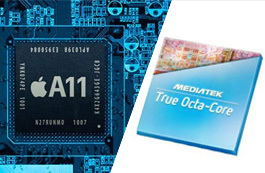 It's interesting that the former is very likely to include NAND flash memory from Samsung, but it is not clear what improvements it might bring. But it's clear that both of the two handsets will have a large storage space so that you will no loner bothered with how to free up space on iPhone 8 and Samsung Galaxy S8. 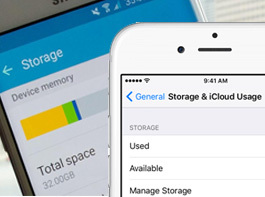 If you still endure insufficient storage space after you switch to iPhone 8 or Galaxy S8 owing to tons of movies/videos or other large files, you can also make use of a file manager for iPhone or Android to transfer media to computers. With Samsung Galaxy S8, we also see Samsung's new virtual personal assistant Bixby to take on Siri in Apple iPhone 8. 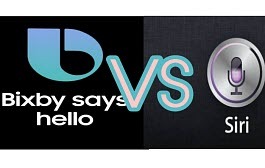 Both as a voice assistant, Siri is getting smarter over time, while Samsung Galaxy S8's Bixby, designed with a goal to allow users do everything on the Galaxy S8 with just your voice, without touch, is unfortunately not as comprehensive or bug-free as it expected for its debut. So when it comes better voice experience in iPhone 8 vs Samsung Galaxy S8 battle, you may better turn to Apple's solution. Battery life wins a big propotion of users' decision about purchasing Galaxy S8 or iPhone 8. Samsung has worked hard to reassure customers that the Galaxy S8's battery will be safe, experienced the debacle of Galaxy Note The 5.8-inch S8 comes with a 3,000-mAh battery, and the 6.2-inch S8 delivers a 3,500-mAh pack. Though your mileage may vary, Galaxy S8 will last 13.6 days on standby and 33 hours of continuous use before you need to recharge it wirelessly or with lightning charging. Also iPhone 8 finally supports wireless charging, which is believed to charge the new phone faster and more convenient. Still, it is rumored in a big battery up to 2,700 mAH or in pair with two batteries, though it haven't announced yet. No matter what it could be, iPhone 8 solves the long-term iPhone battery life drain problem to some degree for sure with the wireless charging. 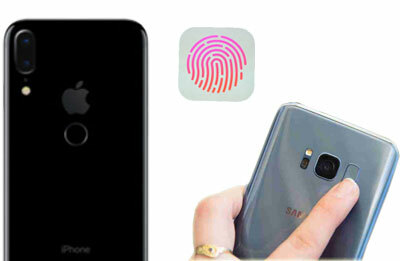 The ID issue is also a big attreaction between Samsung Galaxy S8 and iPhone 8. There is no suspense on Galaxy S8. The fingerprint sensor has been moved to the back, next to camera lens, since Samsung ditched the home button on the front. And you can log in Samsung Galaxy S8 either via face recognition or an iris scanner as well. When it comes to iPhone 8/Plus, it keeps the Touch ID fingerprint sensor as well. iPhone 8 could include iris scanning technology, along with all its other new features. But it's totally a surprise for iPhone X Face ID, which is no less excellent in iPhone X and Samasung Galaxy Note 8 comparison. As long as you set up Face ID on iPhone X, you can unlock your iPhone, pay with Apple Pay for iTunes or App Store, and autofill Safari. In addition the main features above, comparing iPhone 8 and Galaxy S8, what could the "killer feature" of both phones be? iPhone 8/Plus is featured with splash, water, and dust resistance, up to 25% louder stereo spreaker with deeper bass, the same blush gold color with iPhone X. As for Galaxy S8, it supports a new desktop dock called DeX that will let you plug your S8s in and get a PC-like experience, including multi-window support on a big screen, as well as mouse and keyboard support. Still, it's water and dust-resistant and offers a microSD card slot for expanding the memory. 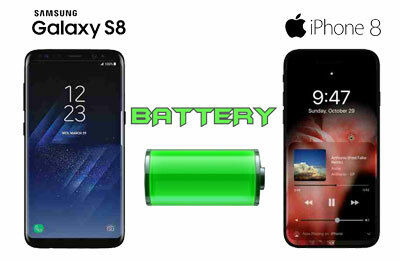 After you have an overview about iPhone 8 and Samsung Galaxy S8? Which do you prefer, iPhone or Android? Or you just wanna upgrage to the advanced iPhone X or Samsung Galaxy Note 8? Anyway, before switching to a new phone, you'd better backup old phone data to get rid of any data lose.